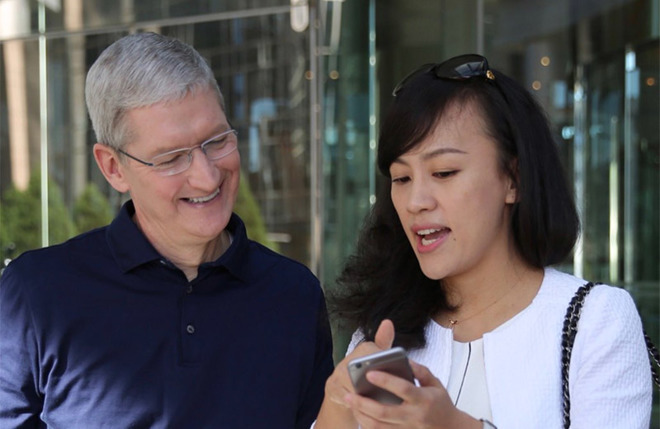 Apple CEO Tim Cook wrote a profile of Didi Chuxing president Jean Liu as part of the "TIME 100 Most Influential People" special, offering insight into Apple's investment in the Chinese ride-hailing service. In the brief writeup, Cook touts Liu as a peerless innovator who, with the help of Didi CEO Cheng Wei, created a convenient and flexible service that now serves tens of millions of commuters. Beyond vanilla platitudes applicable to any ride-sharing service, Cook goes a bit further, lauding Didi's ability to harness burgeoning technology for the good of its customers. Gathering, analyzing and applying "big-data algorithms" to its backend services is apparently of particular interest to Cook. Liu made similar allusions in a 2016 interview, when she said technology is a top priority for the company. She went on to comment on why Didi is a good fit for Apple. Beyond the iPhones and iPads Didi drivers use for mapping and vehicle management, the two companies share a common customer base, Liu said at the time. Alongside Didi's commitment to leveraging cutting edge technology, the firm also has strong ties to the community, Cook said in the TIME profile. "In over 400 cities across China, Jean has also built a company that is dedicated to serving the community around it," he writes. "Guiding Didi to this higher purpose, and giving back to the places where it does business, she shares my belief that companies can and should measure themselves by more than just the bottom line." Cook's commentary offers unique insight into why Apple invested $1 billion in Didi last year, an unusual move for the tech giant who traditionally shies away from large direct investments. Beyond a potential strong return, Cook at the time said Apple's investment presents an opportunity to learn about the Chinese market and opens the door to future collaborations. Perhaps not coincidentally, Didi in March opened a self-driving car lab in Mountain View, Calif., just a stone's throw from Apple's headquarters in Cupertino.